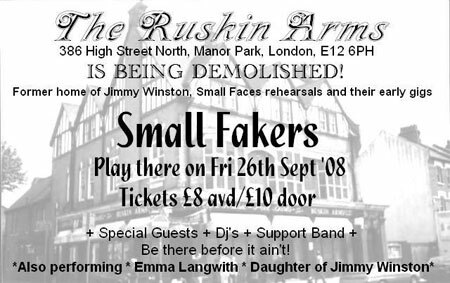 It’s a venue that will be forever associated with the Small Faces, so it’s only appropriate that the Ruskin Arms demolition party should have a Small Faces theme. It takes place tomorrow (Friday 26th September) at the Ruskin Arms, 386 High Street North, Manor Park, London, E12 6PH – one of the last gigs there before the venue is flattened. The night will be headed up by leading tribute band the Small Fakers, along with special guests, including original band member Jimmy Winston. Tickets are £10 and will be available at the door on the night. The venue is ten minutes walk from East Ham underground station.